Home canned meals are great! Hot fresh bread and using up emergency meals. For tonight’s dinner, I made a loaf of fresh honey whole wheat bread to go with my jar of beef stew. The quart jars are a meal but just. Hearty fresh bread rounds them out perfectly. Last summer I was reading up on being prepared for disasters and I researched various kinds of food and considered our lifestyle. I then set about to set us up with everything we would need to sell sufficient and well fed for at least three days. Part of this involved preparing some home canned complete meals we could just open, reheat and serve, or if required, eat cold. By canning at a time fresh produce was cheap and abundant at a local you pick and buying meat on sale, I was able to have one dozen of my own prepared meals to eat. If you have never canned food before, it is important to use a pressure canner if meat or low acid food is involved because boiling just won’t get stuff hot enough to kill nasty spores like botulism. I was very careful to create my meals with that in mind. I also saved some time and energy by making a double meal and eating half for dinner and canning the other half. I made beef stew, chicken stew, spaghetti sauce, chili concarne, minestrone, chicken soup, vegetable soup, beef meatball loaf, turkey soup, turkey stew, mushroom soup, and beef soup. I used all fresh from the local pick you-own-veggies place with lots of fresh herbs (although I did get a bunch of mushrooms off the clearance shelf). 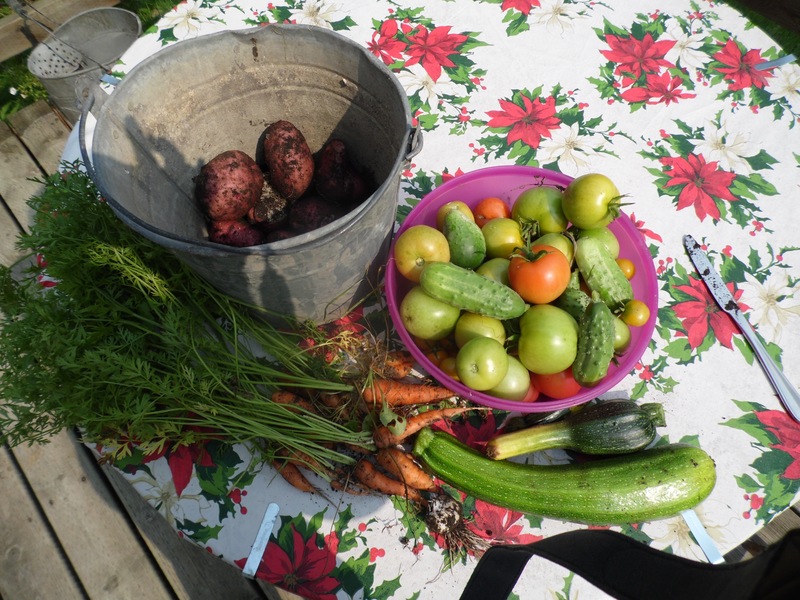 I was very careful to use only vegetables that have a reputation for canning well like corn, carrots, zucchini, potatoes, and beans. I also checked on line to make sure the combinations I used were compatible when canned. The emergency meals are approaching the one year mark and the garden is about to boom with more produce, so I decided we should eat up the old meals in preparation for a new season. So we are working our way through them. I have made one absolutely delightful surprise in this. I always thought those canned meals from the grocery store were horrid because of the pressure canning process ruining the food. It simply isn’t true! Home canned meals taste superb, almost as good as if they were fresh from the pot the same day I made them. They have all the lovely flavour, depth, and texture of home made. In the picture above I show my home canned beef stew with carrots, potatoes, corn, little one bite chunks of meat, celery, parsley, and onions there were used to make the broth and a bit of salt and pepper. I cooked the meat and broth first. I prepared the veggies and then layered them into the jar raw. I poured more hot broth in to fill the jar until I had one inch of head room and then popped it all directly into the pressure canner. I used to use the bread maker for my bread. I didn’t like how the loaves came out so I would use the machine just to knead and then bake it in my own oven and use my own pans. We actually wore out so many bread makers (one about every two years) that we decided to spend a little extra and get a proper Kitchen Aid with the dough hook. I do love using it and that loaf of honey whole wheat bread pictured above is one product of it. Homemade bread is also a great way to use up all kinds of snips and bits of things. For example, in this loaf I added some shelled sunflower seeds that we purchased for salad topping but which were beginning to go stale. The result was a hearty, nut flavoured loaf. Making your own canned meals and bread is one of those things that is a fair amount of work up front but once you get into the swing of it, it isn’t hard. The main issue is you have to be around between steps. For example, the pressure canner has to run for 90 minutes where you need to be in the room monitoring the little bobbing thing on top. So you need to be a stay-at-home type with more time than money to make all this work worthwhile. About two years ago I calculated my bread costs me about 40-60 cents for each loaf depending on the type. The fancy heavy European style dark pumpernickel Hubby dearest loves costs more than plain whole wheat. Bread with honey cost more than bread with sugar. Still the cost is far far below that of buying in the store. The home canned meals worked out to an average of about $3 each with most of the cost being the meat. They are comparable to slightly cheaper in cost when compared to a can of store-bought stuff. However, the homemade meals really cannot be compared to canned meals from the grocery store. When you pick and can local home grown produce the same day, using only really top quality ingredients, well there is just no comparison. I did not include the cost of my electricity in that calculation since at the time I did those meals, we were in a non metered electric site. This year I will have my own garden produce, which will save some money, but have to pay for electricity which will cost some, so the equation may change. My husband paid me a wonderful compliment a few days ago. He said he eats better tasting food at home than he did in his years as a successful scientist frequenting high priced restaurants as a visiting professor. Isn’t he a wise fellow? 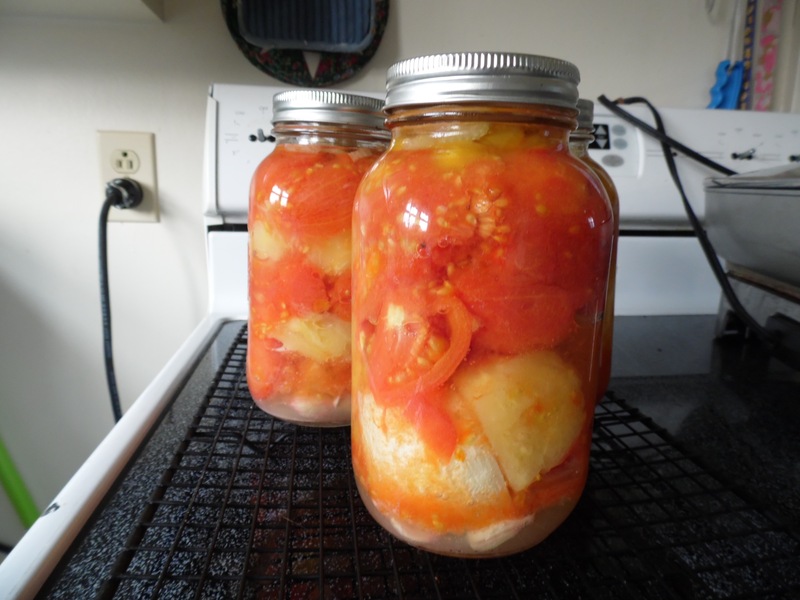 This entry was posted in Canning, Food preservation, Frugal living, gardening and tagged Frugal Living, Rural living on July 21, 2015 by tumbleweedstumbling.